The weirdest thing happened to me the other night. 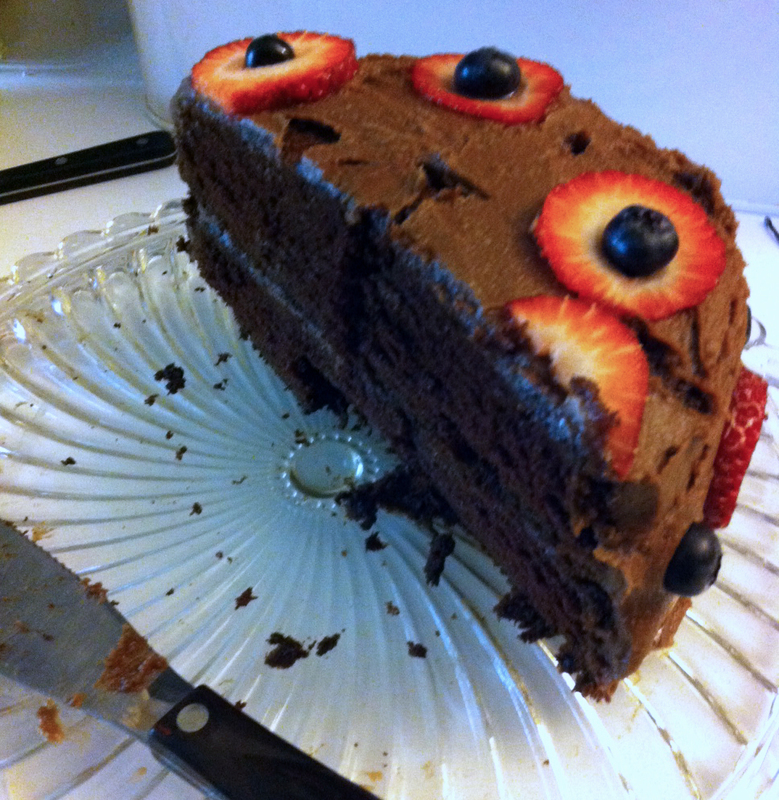 Greta just turned twelve last week, and as part of the festivities she requested the very same chocolate cake as she had last year for our No Sugar monthly dessert: my Grandmother’s Sour Milk Devil’s Food Cake with Buttercream Frosting. I’ve always loved this cake; Greta, for her part, seems ready to pledge allegiance to it. But the night of our family celebration I found I couldn’t finish my piece- it just wasn’t appealing to me right then. I didn’t think anything about it until a few days later, when half the cake still languished in the fridge, and I hauled it out for us to finish off. The girls had no trouble with that assignment, but I… I didn’t like it. Huh? How could this be? I wondered. This was my Grandmother’s cake, after all- one of my very favorites! Why was I behaving as if I were a reluctant kid eating her lima beans? What a strange turn of events. Another similar example came when we recently attended a fundraiser at our local library and the inevitable Bake Sale table was there. The first thing my friend Sue said when she saw me was: “Don’t blog about this! !” But I was actually impressed- sure, there were gummy-worm-encrusted cupcakes and a “fruit punch” that somehow was colored both green and orange at the same time, but a small portion of the table was devoted to paper plates of grapes and sliced cheese. And kids were buying them… not that they weren’t buying the cupcake liners full of frosting too, but they were buying them. This, I thought, is progress. Too bad my kids vote fell on the frosting side of this equation. Ilsa proudly emerged from the fray bearing an oatmeal cookie larger than her outstretched hand (bad enough) and frosted thickly in an unnatural pink (worse yet) before being showered in rainbow sprinkles (seriously?) Then Greta surfaced with what were billed as “Chocolate Chip Cookie Dough Truffles” or balls of cookie dough dipped in chocolate. Have I taught them nothing? I wondered. What happened to all of last year? Despite the fact that I usually manage to keep a pretty good lid on the sugar-treats at home, sometimes I wonder if I’m the only one in our house who remembers last year. Then again- after such a long absence, should I be surprised if they value the ability to have a sugary snack just like all their friends all the more? Greta gave me one of her two “truffles” which I tried. I had that same weird sensation as with the birthday cake- I felt like I was supposed to like it. All my senses were telling me I would- the texture, the smell, the appearance- and yet… I didn’t. I just didn’t. I was utterly confused. It was sickly sweet and left a bad aftertaste lingering on my tongue. Once upon a time I would’ve had a hard time not going back for more of these funky little concoctions, (cookie dough anything? I’m so there!) Now? I was pretending to enjoy it. I was relieved when it was gone. In his book Sweet Poison David Gillespie described this very phenomenon- that as he and his family shunned sugar they gradually began to lose their taste for it, preferring instead much subtler treats: whole fruit, as well as desserts and snacks made with dextrose. The answer- at least for me- seems to be pretty clear: if I want to enjoy desserts I’m going to have to make them myself, with dextrose. I’m not so sure how the rest of my family is going to feel about that. But you know what they say… you can’t have your cake and eat it too. Oh, so thankful to you! I feel exactly the same, after one year of no sugar and I was the cake baking Queen. Now my family don’t know me as I am not interested one bit in a piece of cake. I am at a loss as to how to entertain without cake? Have you tried baking with dextrose yet? David Gillespie’s coconut cake is a true “they will never, EVER guess” No Sugar cake… At every potluck I’ve taken it to it has been the first dessert to disappear! Food is so influential to our society. I’m an enthusiastic foodie. Love food. All different types. At the moment I’m going through a homemade soup and mandarin faze, but since dating my boyfriend who is an avid sports mad freak I’ve realized some of my worst traits. He doesn’t think about food. He eats, fills up and then walks away to go pick up a football or golf club. So when I try to share my habits with him, it brings them into the light harshly. I always knew I’m an emotional eater but have only really realized what that means since beginning my relationship. If I do anything, good or bad, I celebrate or apologise with food. And when I realized it, I was genuinely horrified, but now, trying to change the habit, I have no idea how to do that without shoving cake or lollies at people or at myself. I think it’s times like this, when you come to this realization, this is when you can grow emotionally and socially and change yourself for the better. Im now learning to talk about what I have or havent done, rather than shove ice cream at the situation and ignore it. I think it would be worse for your girls to pretend to like sugary food than use it as a force of good. Explain it to them and pick up a piece of fruit and eat that instead if that’s what satisfies you. Eating disorders stem from shame and loathing. Being ashamed that you don’t like sugary food anymore and eating it just because it’s what is “normal” will only hurt you in the long run. It’s like a recovering drug addict doing drugs just because thats what people expect from them. Stand proudly and smile widely that you have truely beaten the sugar demon and if you don’t want that cake, you DON’T have to eat. I’d rather a mother who is proud of her healthy habits, then a mother who glumly pokes at her cake like its her last day on earth, personally. And I agree- no glum cake-poking for me! That chocolate cake faked me out- I really thought I wanted it- so relearning what I actually enjoy now is my new homework. Eve, there is not something wrong with you, you are perfectly normal! I used to eat sugary junk food all the time. Since quitting sugar I have tried some of the things I used to want and eat. I didn’t like the taste, the texture, the overwhelming sweetness, the mouthfeel or the aftertaste. Thinking back, I’m not sure I ever liked some of the these things. I think I just got into the habit of eating them. I have been reading some studies which looked at the differences between “like” and “want”. It turns out that you can “want” something you don’t even “like”! Going sugar free changes your taste buds too so that you don’t seek out the sweet hit that you used to. I make banana smoothies with plain yoghurt, banana and milk and they taste of banana. Before I used to add honey and caramel topping but all they tasted was “sweet”. Enjoy your new ability to detect actual flavours in food. It’s a gift! It’s weird, isn’t it? I almost feel like I’ve discovered a new superpower: Super Sensitivity to Sweet. I love your idea of the difference between “want” and “like”- it’s a complicated relationship between those two… and I’m realizing I still have a lot to learn about it. You are currently reading A Year Of No Sugar: Postscript 10 at Eve O. Schaub.